The beautifully restored St Pancras Station is both a magisterial example of Britain's finest Victorian architecture, and an exception that reminds us of the dramatic demolition our rail network has suffered. 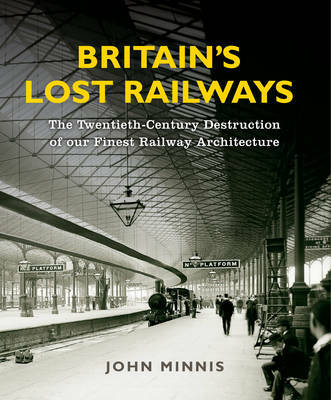 In the name of progress hundreds of buildings were pulled down and replaced, often by nothing more than a concrete bunker or bus shelter Now, in this stunning book, John Minnis reveals the extent of the loss. From the most cavernous engine sheds, like Old Oak Common, through the eccentric country halts on the Tollesbury line and the Meccano-like gantries of the Liverpool Overhead Railway, to the soaring viaducts of Belah and Cumlin, Britain's Lost Railways offers a sweeping pictorial lament for our lost railway heritage. Not one building displayed in this book - often in a hitherto unpublished photograph - still exists. All that remains of them are pictures and memories; fragments of the past that serve as a testimony to an age of ingenuity and ambition when the pride we invested in our railways was reflected in the grandeur of the architecture we built for them.